Ohio Communist "We Are Now in a Time of Great Opportunity and Tremendous Danger"
Bruce Bostick is a retired Ohio steelworker, activist and veteran of the 1970s Venceremos Brigades to Cuba. He is also a senior member of the Communist Party USA. In a recent article in the CPUSA's Peoples Weekly World, Boston confronts the problems and opportunities facing the US far left in the Obama era. Bostick realises, as do we, that the US (and the planet)is at a crossroads. The communists want to build a union led "people's movement" to work with Obama to move the US permanently to the left. US patriots want to restore their constitution and their republic. They are starting to fight back. The T.E.A Party movement was a great start. Local Republican opposition to Obama's bail-out plans are another promising sign. To Bruce Bostick and his comrades, such protests (if not checked) are the beginnings of US "fascism". The communists understand that Obama brings great opportunities to advance ther agenda. They are going fight tooth and nail to prevail. This past year, our nation’s people were active and mobilized like no time since the New Deal. We rose up and gave the boot to the ultra-right corporate Bush regime. It was, and is, a time of mass revulsion with the wars, lies, union-busting and pension-stealing of Bush and his cronies. 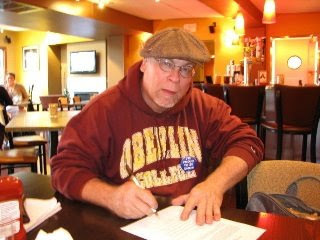 Leaders of organized labor and the mass people’s movements were unanimous in saying they intended to “hit the ground running” after the elections, in order to mobilize people to push for strong progressive reforms: universal health care, labor law reform, jobs, K thru 12 fully funded public education and more. Our people won a tremendous victory. Barack Obama is now our president, and we have seen some positive gains. The stimulus bill passed and millions of jobs have been saved or created, Bush’s anti-labor executive orders were reversed; a new, more positive budget has been passed, with big money set aside for health care reform; troops are beginning to leave Iraq and a new, friendlier policy toward Cuba is beginning to take shape. All these steps are definitely in a positive direction. However, corporate, conservative forces in the administration are pushing for more monies for the banks, General Motors bankruptcy and busting the United Auto Workers union. Without a major mobilization of the people, led by organized labor’s massive power, the system will remain intact, with only minor shifts. The far-reaching, progressive reforms that we’ve fought so hard for are in danger and the anger of the people could be turned in self-destructive directions. I believe that those who declared that we’d “hit the ground running,” meant every word they said. Even President Obama was very clear in stating that “change comes from below.” However, life and times have a way of exerting their own imprints on events. That great people’s mobilization has, as yet, not materialized. There are a number of very real reasons why this is the case. Yet, there is a great urgency, demanding that very organized people’s upsurge. It is true, as some now say, that a massive mobilization of labor is a very expensive proposition, and the unions and mass organizations spent far above their budgets to defeat Bush and our main enemies. On the other hand, the cost of not organizing that needed mobilization may be far worse. Our ship, the Obama administration and a new, more positive balance of forces, has docked. Missing this ship could mean missing the opportunity to pass the Employee Free Choice Act and rebuild our nation’s labor movement. Would it be “cost effective” for our people to miss the best chance we’ve ever had to win national health care? The cost in the suffering of working people is just too horrible to consider. Seeds of possible consequences of continued inactivity by labor can be seen in recent mobilizations by the extreme right. While many would like to dismiss the right-wing “tea-party” demonstrators as only nutcases yelling at the wind, they may represent far more negative developments. People out here in “real America” are extremely angry, frustrated that all they had is being taken away, while billionaires, deaf to our pain, continue — with the new administration — to live like sultans, now on our public dime! The tax structure has been twisted into a giant scheme to funnel working folks’ monies to the richest of the rich, and while the tax demonstrators were, actually, rallying against Bush’s tax structure, the people out here only know that they are hurting. Working people are justifiably angry and are begging for leadership to help them express their pain, and help them fight their way out. Make no mistake about it: if we do not offer real positive leadership, our enemies will. The result of that would not be pretty. It could actually BE fascism! Not the phony “fascism” the ultra-right is calling Obama’s efforts now, but the real, home-grown, lynch-rope toting, union-busting, “we don’t have to pretend that you have any rights” kind of fascism. That is how big the stakes are. Some may say, “It’s early yet.” However, early becomes late awfully quick in times of great crisis, like now. More to the point, there is a political culture that we must break, one that says democracy is a spectator sport and that the only players are the millionaires that can afford to play. Our job is to vote once every four years, then go home. But the new people’s democracies in Latin America are redefining democracy. And our own history, with the labor-led people’s upsurge of the 1930s and ’40’s, showed that a mobilized people, pushing and supporting a progressive government, can bring about great positive changes. That upsurge brought us Social Security, unemployment compensation and the Wagner Act that enabled workers to organize the mass production industries. It took both — the organized, mobilized people allied with the progressive New Deal government. We have one of those two: the new progressive Obama administration. History awaits the development of the other needed component: the organized, mobilized labor-led people’s movement. Obama cannot win the Employee Free Choice Act, real health care for all, real pension reform for all, and more, by himself. He even told us so! And no sector of society has the organized power, the long-range view and the ability to create massive coalitions and move them forward, except the labor movement. Obama’s administration is a mixed bag, including, alongside many progressives, some pro-corporate “liberal” forces. These will push to repair the old, corrupt system, leaving it intact with only minor reforms. The mass labor-led people’s movement can move things much further. Employee Free Choice can be passed and massive gains made by working folks. Real health care for all and pro-worker pension reform for all are at stake, and much, much more. We need to speak out at union meetings, central labor bodies, state federations and retiree groups, calling for labor to act now to mobilize our people. Mobilization can mean a million or two working families, led by labor, marching on D.C. to support our demands. It can also mean dozens, or hundreds, packing city councils or county commission meetings to urge those bodies to act in the people’s behalf. Demonstrations can pound the walls of state capitals, as well. It may also mean organizing our folks to write letters to Congress or state reps, set up phone banks or run postcard campaigns. Whatever the form, we need to build this people’s movement now. In all we do, we need to help others understand that what is good for labor is also good for our nation as a whole. Well now we can't say we haven't been warned! Sounds like the Communist Party USA is certainly running the conspiracy mongering by MSM on the Tea Party protests.